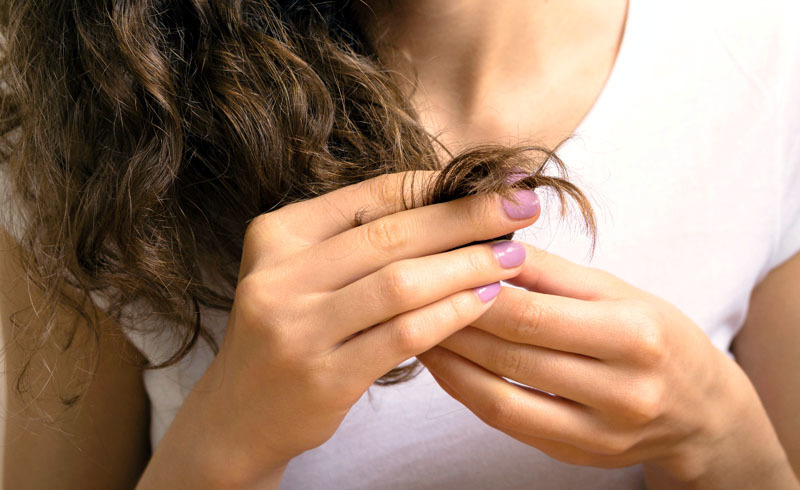 Once split ends start popping up, it seems like there’s no stopping them—but there is hope. Rethink your style if you throw your hair in the same ponytail or topknot every day. “If you wear your hair up all the time in the same spot, that can cause a lot of stress to the area,” says Mackenzie Day, stylist and owner of The Artist Haus. Over time, that tension could create breakage, especially if you tie your hair up when it’s wet or in a steamy shower. Day recommends using snag-free hair ties and switching up the position of your ponytail or topknot so the same spot isn’t always under pressure. Shampoo strips away your hair’s natural oils. Do it too often, and your tresses will be get dry. “Once you create more dryness, you create more knots,” says Paul Labrecque, founder of Paul Labrecque Salon & Spa. Once you start trying to tear through those knots, he says, you could end up ripping the hair and creating split ends. As long as you’re using decent hair products, there’s really no need to use clarifiers regularly, says Lorean Cairns, owner of Fox & Jane Salon. In fact, those products could do more harm than good. “They’re pulling nutrients out,” says Cairns. They’ll end up damaging your hair by making tangles and split ends worse. Shampoos with sulfates also tend to dry out hair and make it prone to split ends and breakage, she says. To avoid split ends, don’t rough up your hair when you’re shampooing and conditioning. “That can create a lot of work for you during detangling, and frizz and flyaways,” says Cairns. Brush through once with your wide-tooth comb, then just let the water run down to rinse. While roughly towel-drying hair won’t directly cause split ends, it will create knots. Once you try getting those knots out, you’ll end up ripping your hair, says Labreque. Prevent split ends by wrapping a towel around your head after your shower instead. “You won’t create knots because you’re wrapping the hair in a free-fall,” he says. Wet hair is more fragile than dry, so brushing through it can create damage, says Cairns. “Wet hair will become bendy and stretchy because the elasticity has changed, and it will just snap,” she says. Use a wide-tooth comb in the shower before rinsing out your conditioner to keep knots at bay while avoiding split ends, she says. Day recommends using a detangler spray and a Wet Brush, which has flexible nylon bristles that are gentle on hair. When brushing your hair, you might automatically start at the roots and work your way down your head. But doing that will actually make your knots worse. “You’re forcing the tangles to compact to the bottom of the hair,” says Cairns. “It’s still tangled and gets worse.” Start at the ends of your hair, then work your way up to the midshaft before combing through the roots, she says. You already know blow drying your hair can create heat damage. “People put it too close to the hair, and it singes the hair,” says Day. To avoid damage, dig out the concentrator that came with your blow dryer, she says. The duckbill-like attachment not only directs the airflow, but also adds a couple inches between your hair and the tool’s hot metal. “Blow dryers have a shelf life,” says Cairns. “I’ve had many clients with significant areas of breakage and it looks like the hair is melted. The common denominator is generally, ‘I’ve had my blow dryer for ten years or six years.’” An old blow dryer might seem like it works fine, when it’s secretly doing major heat damage, she says. Over time, it’s harder for the blow dryer to avoid overheating. Your hair will dry faster than ever, but at the price of your hair health. Time to break the habit if you use a curling iron or straightener every day. The high heat can kill the proteins in your hair. “Even though the hair doesn’t have feeling-sensitivity and we can’t feel when we’re overheating it, it doesn’t mean the nutrient makeup of that hair can withstand those levels,” says Cairns. She recommends using a protective serum every time you use heat to create a barrier between the tool and your hair. Keep it slow and steady when using a flat iron. “People usually go fast on the same spot over and over and over, and they will absolutely cause damage that way,” says Cairns. Take a thin section of your hair, and use a comb as you glide over each piece with the straightener. You’ll only have to go over each section once, or twice at most. Prevention is key, but once your hair starts to split, no product can fix it. Your only option is to cut the damage off. “Trims are important because they cut split ends off so they don’t climb up the hair and cause more split ends,” says Day. She says getting a trim every six weeks is a good rule of thumb, though you might need to go more or less often, depending on how well you treat your hair. Even with healthy hair, though, you should never go more than four months between cuts, she says. Hair color can change your hair texture, especially if you’re going from dark to light. Don’t go get your hair colored without asking for a trim afterward. “It’s important to get the ends trimmed after color services to help maintain hair health and improve the texture of the hair,” says Day. Sure a razor can give your hair great texture, but a hairstylist should only use one if you have very thick, healthy hair, says Labrecque. “Razor cuts make split ends because they’re not cutting bluntly on the ends,” he says. Request a pair of regular shears if you have curly or frizzy hair.